John Bosco was born in 1815 and grew up in a small farming area called "i Becchi", in Northern Italy. His father Francis died when John was only two years old. The photo above is of the farm building Francis bought shortly before he died. John's mother, Margaret, moved her three boys, herself and her mother-in-law into this building after her husband's death. She converted it so that it had two bedrooms, a kitchen-living room for the family, a barn for the animals and hay storage. Don Bosco lived here until he was 16. Don Bosco was ordained to the priesthood in 1841 in Turin, Italy, where he began his ministry to youth. He invited some of the young people who frequented his youth center, called the Oratory, to join him in his work. From these humble beginnings came the religious community of men dedicated to youth ministry and education. Today the Salesians serve in over 130 countries and number 15,700, the second largest religious community of men in the Catholic Church. 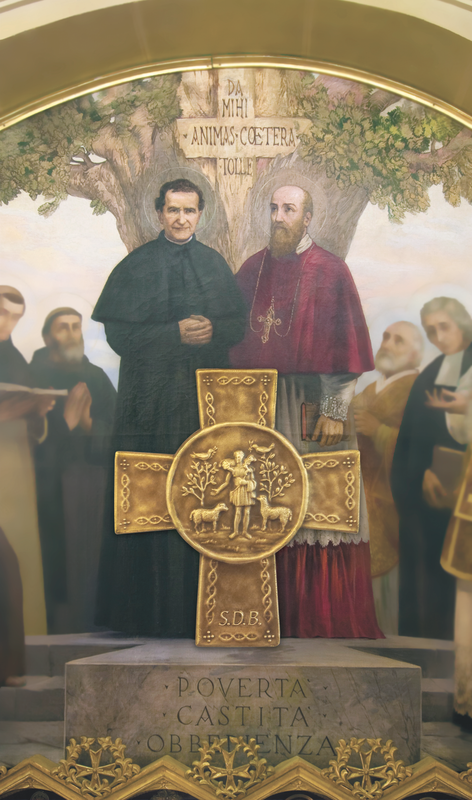 Don Bosco's vision of a community made up of lay and ordained ministers was unique. Bro. Larry King, SDB, tells an amusing story, "Some years ago I was camping with a group of my Salesian brothers. We were sitting around a campfire at night talking, singing, and laughing. The noise attracted a nearby camper who came over to see who we were. After listening to us for a few minutes the visitor suddenly exclaimed, 'You're all bachelors, for Christ's sake?' To which I immediately replied, 'Yes! For Christ's sake, we are all bachelors!'" Salesians are not really bachelors, but we do live for the sake of Jesus Christ and his Gospel. We are Catholic Christians who have made a solemn promise, a vow, to live our lives in the Salesian community and serve in the ministry of the Salesians. We take a vow of poverty, chastity and obedience. By these, we promise to share our lives together, in a chaste celibacy making ourselves available for ministry to youth. The Salesians of Don Bosco (SDB) form a community of religious. Some are lay religious like Br. Larry King, SDB, quoted above, and some are ordained religious priests. We refer to ourselves as the Salesians of Don Bosco. The Salesians minister to young people in high schools, parishes, youth centers, boys and girls clubs and retreat ministry. Here in the United States there are two provinces: The Western Province with headquarters in San Francisco, California and the Eastern Province with headquarters in New Rochelle, New York.